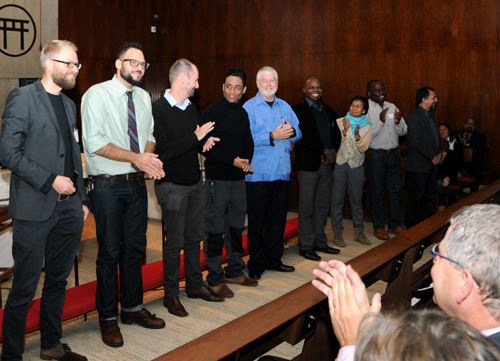 Christian leaders from four continents met for a Micah Summit at the United Nations in New York this week. The Millennium Development Goals (MDGs) were adopted at the same venue in 2000. Participants from the Micah Challenge campaign (formed by the World Evangelical Alliance and Micah Network as a response to the 8 MDGs) grappled with the implications of being a prophetic voice to tackle poverty injustice and having a thoughtful and balanced approach to advocacy. According to Dr. Ron Sider, distinguished theologian, Christians have for too long taken the "ready, shoot, aim" approach to social issues. Instead they should take more careful aim at systemic change by careful research and fact finding, so that "shots" are effective. The Micah Summit marked the end of ten years of global campaigning by 25 national campaigns and a transition to a new Micah structure to address the UN's post-2015 development goals. According to prominent theologian, Professor Miroslav Volf from Yale University, the Church must speak prophetically into market economics. "The well lived life needs to embrace contentment beyond the inherent greed of owning more", he claimed, "and that means conversations about God and transcendence." Ron Sider, who has written about social and economic issues for 30 years urged that "we need to be troublemakers to the system. (...) The Church needs to be intelligent and strategic." The Summit included lively discussion about what that means for local churches in situations of violence, religious persecution, or corruption. Speakers from nations with troubled histories including Sri Lanka, Nigeria and Nepal all stressed that doing justice must complement acts of mercy for effective long-term transformation. The gathering culminated in a 'Celebration and Sorrow' service stressing the achievements and shortcomings of the last ten years of campaigning by churches around the Millennium Development Goals. There has been dramatic increase in primary school access for millions, and absolute poverty levels halved and child mortality have both been cut in half. However, maternal mortality remains stubbornly high, the quality of education and health care globally is patchy and a billion still lack basic sanitation. The Summit service ended with Mercy Hilderbrand from Canada, born at the beginning of the millennium. Now 14, she pleaded for adults to be "utterly relentless" in their determination to see the MDGs fulfilled. "You must refuse to give up. You must leave the Micah Summit with an urgent calling to be the generation that ends extreme poverty once and for all."